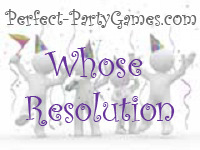 Summary: Whose Resolution Is It is a game where you guess who wrote the new years resolution. Have each player write down one New Year's Resolution they have for themselves. The odder the resolution, the better. Put all the completed index cards into a bowl. Have someone draw out the first card and read it aloud. All the players in the room have to guess whose resolution that is by writing down on their numbered sheet the name of the player they believe best matches. Have the host write down the number one on the first index card drawn, the number two on the second, and so forth to keep track as the game is being played. Winner: The player with the most correct answsers wins.